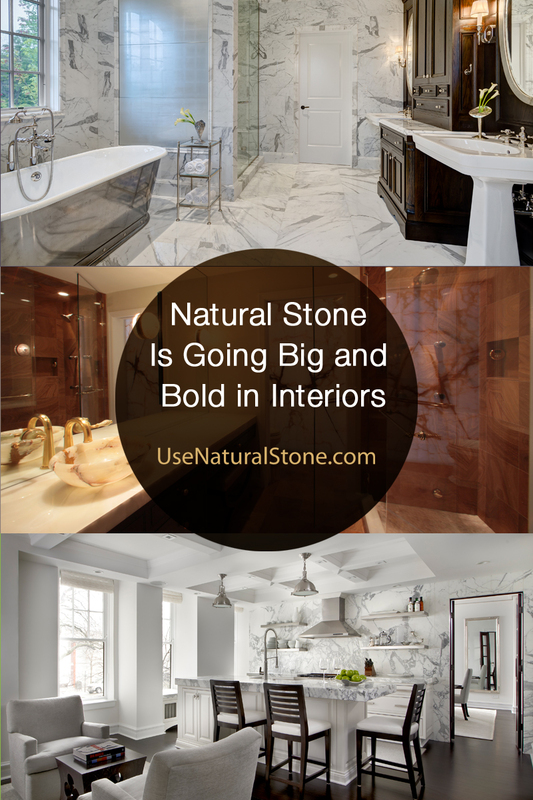 Natural stone is going big. Homeowners are asking for stone to be used on vertical surfaces indoors, especially slabs among high-end design projects, to make a bold design statement. New natural stone options are making it easier for homeowners to get creative. Designers are starting to see natural stone used in new and refreshing applications. 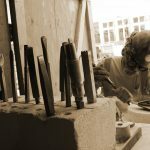 “We are noticing an increase in demand for the use of stone throughout people’s homes,” says Alyssa Bockman, design consultant with Stoneshop. “Even just in countertop applications, more customers are asking for waterfall panels and edge treatments to enhance the thickness and really create a ‘wow’ factor.” Wall applications, she says, have definitely become a trend. Rebekah Zaveloff, co-founder and director of design of KitchenLab Design, also sees the trend for big and bold stone applications. 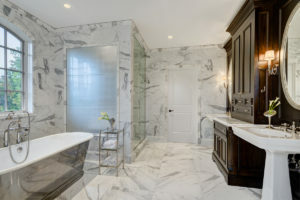 Full-height marble or quartzite backsplashes and fireplace surrounds are trending, and slab materials are being used to wrap the inside frames of showers and niches on walls inside and outside the bathroom, she says. Why are homeowners suddenly starting to go big with their natural stone applications? 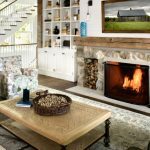 Homeowners are beginning to appreciate the texture and dimension in stone, which is part of the reason Brock Mettz, owner and lead designer at Brock Lane Mettz Design, believes clients are asking to use very large format stone in projects. For many clients, bigger means better. “This leads to the beauty of the stone speaking for itself and acting as the decoration, instead of having to add extraneous decorative elements into the design,” he says. Mettz especially loves seeing manufacturers take a stone that they’ve been using in the industry for years, and then cut it from the stone block in an atypical fashion. “Depending on how the stone is cut from the large stone blocks, veins can be accentuated and new colors may pop that would have previously gone unnoticed,” he notes. Photo courtesy of Toni Soluri Photography. When working with such large pieces, color matters. Sometimes it means you need to work with the color of the slab or what surrounds it. 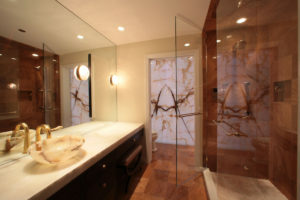 In most cases, designers will advise clients to consider the long-term decision of both color choices and the type of natural stone being used in a particular project. Choosing natural stone based solely on its color because it’s trendy isn’t something designers often recommend. 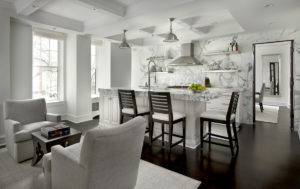 When clients ask Zaveloff about color choices, she encourages them to stick with what’s timeless. Other colors in the room, such as paint color, are much easier to change. Lauren Coburn, owner of Lauren Coburn, LLC, specializes in high-end residential interior design as well as interior architectural consulting, notes that when choosing natural stone, homeowners are making a big financial investment. “Choose a stone that can work with a bold color you like now, but one that will also work with more neutral colors down the line, should you choose to change the paint or wallcovering,” she says. Backlit onyx. Photo courtesy of Centaur Interiors. What’s even more exciting when it comes to color and design trends and natural stone is that people have more options to get creative. Coburn adds that with more options, clients are also realizing there are endless ways to use stone on walls. Since these are areas that aren’t being touched a lot, more exotic and less practical materials can be used on them. Coburn notes that making a bold statement isn’t restricted to a foyer or main living area. It can take place in a room like a master bath. Taking stone all the way up the walls in a room like a master bath can create a high-end ambiance without it feeling heavy or overwhelming, if the right stone is integrated into the project.